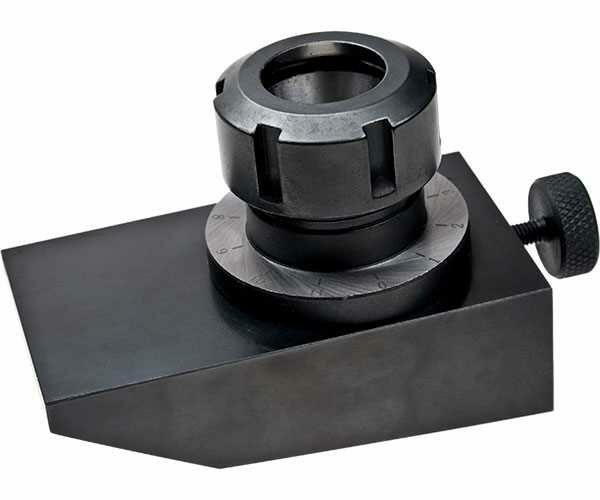 This fixture is used to grind 2, 3, 4, 6 and 12 fluted end mills and shell mills, normally on a surface grinder, using a magnetic table to hold the fixture. It is designed to grind the face only, not the flutes. 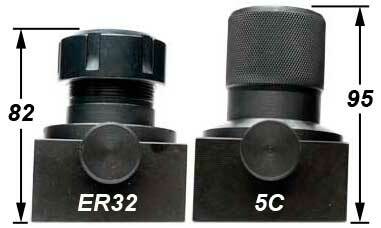 Any metric or imperial shank between 2mm and 20mm can be held with a suitable ER32 collet. Cutters are easily locked in place using the top mounted collet nut with the fixture still stuck to the table (5C sharpening fixtures have to be removed from the table since they are locked from underneath with a pin spanner). The base of the fixture is angled so the 4.5° cutting edge angle is ground slightly deeper towards the centre of the cutter by 2°. The second angle on the base is for grinding a 30° clearance angle. By using ER32 collets, a height reduction of about 13mm is achieved compared to similar 5C fixtures. This can be important on grinders where the table to wheel distance is limited.